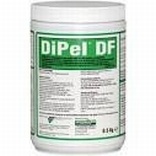 DiPel DF is a biological insecticide for the control of caterpillars (Lepidopterous larvae) in vegetables, soft fruit, ornamentals and amenity vegetation. Ideal for use in integrated pest management (IPM) programmes. Based on a naturally occuring micro-organism DiPel DF contains Bacillus thuringiensis var kurstaki with a potency of 32,000 IU/mg formulated as a water dispersible granule.